From Stella Nyathi, the talented and well organised Knit for Life manager in Zimbabwe. (Pictured on left). I was born in Zimbabwe in Chirumadzu in the Midlands province into a family of 7; 4 girls and 3 boys (2 brothers lost to Tuberculosis). I learnt knitting from my mother at the age of 12yrs, married at 18yrs, started working for a knitting company called Spiderweb trained in crotchet, embroidery, to be a checker quality control and to be able to train women from rural areas to earn a living on knitting. We exported our knitting to the UK. In 1998 the company closed due to financial problems. I met Mrs Lilly Ellis who trained me in baby wear and worked with her twin daughters founder members of Grasshopper [Now Knit for Life] since 2001. I look after my husband, my 2 sons, my mother aged 74yrs who is now a cancer patient and my 2 sisters one is metal ill and my brother their 7 children who are doing their primary education. 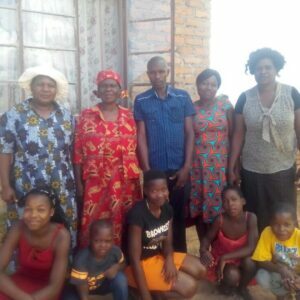 Knit for Life is a registered charity empowering women in rural Zimbabwe to use their knitting skills to alleviate family poverty and provide an education for their children. Copyright 2019 Knit for Life all rights reserved.